Every day, I encounter people who champion their pet causes and, very loudly, declare their belief in something that many would not really even consider as an important issue. This is not to say that they are not important, I just think these things may not be on people’s radar. Recently, I have been reflecting on this concept, and I have realized that many actually put a lot of energy into arguments, protests, and causes that I think really need to be deeply analyzed for their eternal value. I am just one person, and I have opinions like anyone else, but I really believe that many have lost sight of what is truly important. When our priorities are out of focus it affects every aspect of our lives. 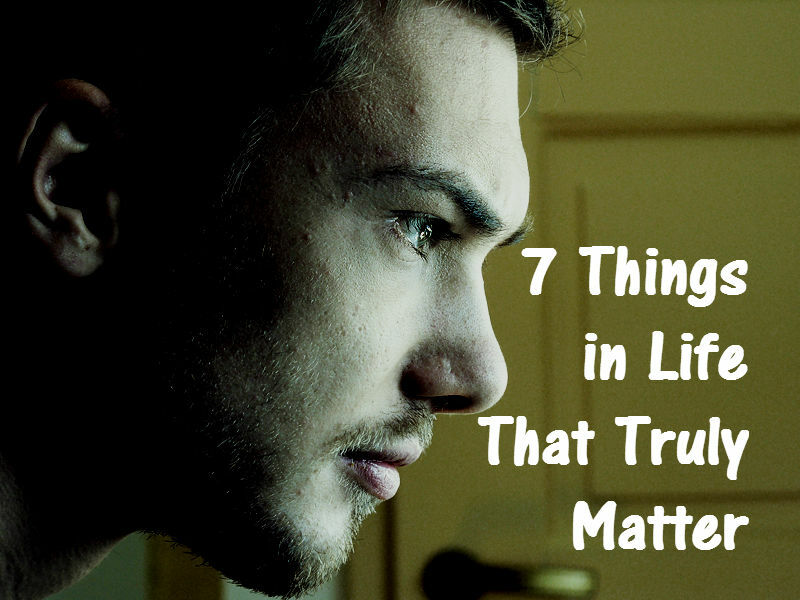 Understanding there are many others, today, I wanted to talk about 7 Things in Life That Truly Matter. 1. Your past matters– Realizing this, and acting on it accordingly will change a person’s future. I can’t tell you how many times I have sat down with a couple or individual and they poured out their pain, anger, and bitterness to me about a particular subject only to realize that the feelings they were having were directly related to a past hurt that was never acknowledged. Many people put up walls, and adopt unhealthy lifestyles, and even develop habits due to this idea. Then, often what happens is a person spends most of their life justifying why the way they are living should be universally accepted when others, who love them, clearly see that they are being eroded by it. Don’t discount the pains of your past. Your past matters, and if not treated appropriately, it will affect your future. 2. Your attitude matters– It is harder to be dragged up a mountain than to be pushed off a cliff. Point being…with any experience you are involved in, if you approach it with a horrible attitude, you are probably going to find a way for the outcome to be horrible as well. How you feel about your church, your spiritual life, your friends, and your family directly correlates with the attitude you approach them with. Change your attitude; change your outcome. 4. Your family/parenting matters– Whether you are a parent or not, it is obvious that parenting matters. I am not talking about a certain parenting model or the newest book that solves all your problems. Parenting (whether biological, guardianship, or surrogate family dynamic) is a vital component in the way that humans understand God, themselves, and the world around them. This concept relates to the first topic discussed here…the past. An absent parent figure can cause one to question whether they are loved, valued, and have a purpose. Family is also included in this…as we raise one another we (hopefully) build a necessary support system for the future. If this is not present…then people began to feel alone, and disconnected. 5. Your relationships matter– I have seen the same quote floating around social media for a long time. The theme of this quote is this…if someone in your life is making you unhappy, you should cut them out of your life. According to the rest of this quote, “life is too shoot to spend it with people that don’t make you happy.” This is absolute trash. Plain and simple. If you are recently divorced and experienced abuse, or infidelity, I could understand where you are coming from…but other than this…the concept is a lie. First, we are not put on this earth to constantly be in a state of happiness. We are called to invest in things that are hard, and spend what little time we have in this world pouring ourselves into others. We can find joy in this…Second, the people around you matter too. Consider the pain of a person who may have lived a life defined by abandonment before you completely cut people out of your life. Granted, for your emotional safety you may need to be careful not to be sucked into the vortex of hurt and confusion…you will be rewarded if you walk through the valley in a healthy way with others. 6. Your faith matters– Whether you believe in God or not…your faith matters. If you believe in yourself as the supreme council or you trust in a guiding force, your values, thought processes, and actions flow from this posture. Grow in this area, and seek others to help you to grow. If you are still seeking what this area looks like for you…find someone who exhibits joy, integrity, generosity and a passion for others, and inquire accordingly. 7. You matter!– Despite what the enemy of your soul is whispering in your ear right at this moment…you matter. You have a purpose in life and even though you do not have the skills and talents you wish you had, God has given you exactly what is needed to be you. If you were missing, the world would not be the same, and everyone around you would feel the burden. Satan wants you to think that no one would care if you disappeared…this is because he is scared about what God has for you. I know…there are so many more things that truly matter, and I will write on more later. Let’s take a moment today to reflect together on what things are truly important. Landon makes some lovely points to keep in mind.